Any special event can be catered for with weddings and anniversaries a specialty. For such a unique day, you want to be confident you are securing the services of a professional who can fulfill all your musical requirements. In particular, rather than play music that is solely derived from standard classical guitar material, Jason has spent considerable time cultivating a breadth of musical styles. View the repertoire page and you will see jazz standards, ballads, pop songs and movie love themes on an equal footing with famous classical guitar pieces. Guaranteed, there will be many musical gems listed to make your day special for you and your appreciative guests. A typical wedding guitarist booking scenario can involve music before the vows, drinks afterwards and/or the breakfast (ie dinner after the wedding). This can be altered depending on your requirements. Music for walking down the isle is a specialty – among pieces requested have been Estudio 5 in B minor (Fernando Sor), The Godfather love theme (Nino Rota), It Had To Be You (Sinatra, Streisand, Harry Connick Jr) and Everything I Do (Bryan Adams). 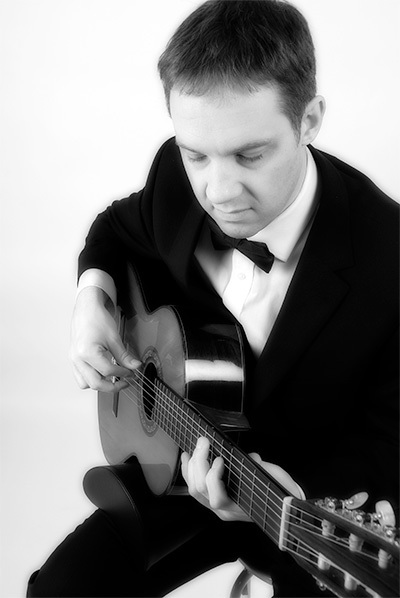 For a wedding that requires an electric classical guitar, formal attire and playing for two hours fees start at £400. This can increase depending on the distance traveled and length of time required to play. For a quote and prompt reply you can contact Jason from the contact page linked in the menu on the top right of the website.